Medicare for All: Can Bernie Sanders overhaul US healthcare? It's widely known that the US has the most expensive healthcare system in the world, and health outcomes vary according to your means. His successor in the White House has tried to dismantle that legislation, making healthcare a central issue in next year's presidential election. Senator Sanders' plan - called Medicare for All - will play a big part in the debate. It is not a universal health care system where the government would own and operate hospitals - instead, the government would pay private providers an agreed upon rate for their services. Under Senator Bernie Sanders' proposal, first introduced in 2017 and re-introduced in April, Medicare for All would expand Medicare's coverage to include vision, dental, prescription drugs, nursing home care and reproductive health services. The 2019 update to the plan also includes a long-term care coverage for patients with disabilities - amending one of the criticisms of his earlier plan. 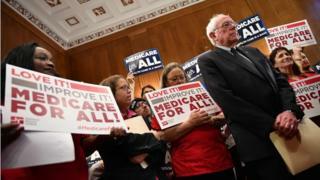 The change also brings Mr Sanders' plan more in line with the version of Medicare for All proposed in the House of Representatives by congresswoman Pramila Jayapal of Washington state. In four years, Mr Sanders' plan would have the country phase out of private insurance plans so everyone would receive insurance from the federal government. Private insurance companies and employers would be banned from selling any manner of duplicate plans for services covered under the government's programme, though plans for non-essential medical services like cosmetic surgery could remain. Mr Sanders' proposal would see an end to the "cost sharing" that makes up the current system: No deductibles, no premiums, no co-payments for care. The only out-of-pocket expense under Mr Sanders' plan would be for some non-generic prescription drugs, but any cost to the patient would be capped at $200 annually. Mr Sanders' Medicare for All would see a new 6.2% tax paid by employers on all wages; estate tax reforms; more taxes on the wealthy; and a 2.2% income tax on personal income with no credits allowed. Ms Jayapal's plan mostly tracks with Mr Sanders', but also includes provisions to roll out the programme in two years instead of four, offer no out-of-pocket costs at all for prescriptions, and grant the government the ability to issue generic prescription licences to bring down costs if negotiating with companies fails. On Wednesday, Mr Sanders made clear once again he's in the latter camp. The plan the Vermont senator proposes would be more generous than government-run systems in other countries. That may appeal to voters - at least until the price tag is discussed. Mr Sanders, who preaches "political revolution", doesn't do small and incremental, however. He's again cutting a path to the party's left. Can he again convince others to follow? With millions still uninsured - and forgoing care because they cannot afford treatments - Medicare for All would ensure healthcare is a right for all Americans. The government's bargaining power would drive down healthcare costs, supporters say, pointing out that government health programmes like veterans' health already receive 50% in discounts on prescriptions. Other analyses have also found that a single-payer plan would ultimately reduce total national healthcare spending. University of Massachusetts Amherst economist Prof Gerald Friedman estimated savings could be between $5.5tn and $12.5tn in the next decade. One report by the Citizens for Tax Justice advocacy group found that for all but the highest-earning Americans, Mr Sanders' plan would result in an increase in post-tax income. A study by the conservative-leaning Mercatus Center also found that Mr Sanders' plan would see a $482bn decrease in health spending and $1.5tn in administrative cost reductions, amounting to a $2tn decrease in health spending in a decade compared to current projections. But some experts worry Mr Sanders' current tax plan would not adequately finance a Medicare for All programme, and that actual taxes could end up being even higher. Both Mercatus and the Urban Institute - institutions that lean conservative and liberal respectively - put 10-year costs at around $32tn. The Mercatus study noted that for the Medicare for All plan's savings to work, providers must acquiesce to a 40% reduction in reimbursements compared to current private insurance payments. The issue of wait times is also one many Americans are wary of given horror stories of year-long waits for surgeries from the NHS and Canada - opponents say the increased number of patients in the system may overwhelm providers already dealing with budget cuts. Under Medicare for All, abortions would be covered by the federal insurance plan - an aspect that will certainly draw criticism from conservative groups who are already outspoken against any federal funding for the controversial procedure. The nonpartisan Kaiser Family Foundation (KFF) similarly reported six in 10 Americans are in favour of a national health system. But support for Medicare for All fluctuates based on how it's described, the March poll found. Firstly, it's a lot more expensive in terms of cash spent. Medicare for All would move the entire US system into a single-payer, social insurance model - very similar to Canada. Canada's government funds universal healthcare coverage by reimbursing private providers. Provinces and territories are able to operate their own programmes with varying levels of coverage, so it is not entirely controlled by the federal government. In the UK, in addition to covering the costs of care, the government owns hospitals and employs physicians. Prescriptions in hospital are free and those for outpatients are subsidised, so that patients generally only pay a minimum co-payment - usually around $12 (£9). For some groups, prescriptions are completely free, like those under 16, the elderly or full-time students up to age 18.